Despite several high-profile Congressional hearings about skyrocketing prices of prescription drugs, Tegna Media investigations reveal that dozens of drug prices continue to rise. Members of the Congressional committee that grilled the maker of the EpiPen in September accepted $366,000 from pharmaceutical companies during the last four election cycles, according to records provided to 9Wants to Know from the Center for Responsive Politics. In all, the same records show pharmaceutical companies handed out more than $27 million to Congressional campaigns since 2010. Moreover, eight major pharmaceutical companies spent at least $100 million lobbying congress from 2013-2015, and – according to the most recent financial reports filed in 2014 -- at least 72 members of Congress have between $8.3 million and $18.9 million worth of assets invested in 13 major pharmaceutical companies. Colorado representatives, one a Republican and the other a Democrat, insist the payments don’t influence their voting habits, but a 9Wants to Know investigation into rising drug prices suggests drug companies sometimes get Congress to vote the way they want after throwing millions into lobbying and marketing efforts. In 2013, members of Congress appeared all too eager to pass H.R. 2094. Thirty six Representatives signed on to sponsor the bill came. Twenty were Democrats. No one raised any substantive arguments against the bill as it sailed through Congress before finally landing on the President’s desk on November 13, 2013. The bill’s name carried with it a title everyone could easily rally behind. The bill, a good one by all accounts, allowed schools across the country to stock injectable epinephrine. Worried parents could rest easier knowing their sons and daughters with food or insect injuries would just be a minute or two away from epinephrine if a case of anaphylaxis hit. Lost in the bill’s praise, however, was the fact that the bill was going to primarily benefit one company. “To me, [the bill] was a brand awareness thing,” said University of Denver Daniels College of Business Adjunct Professor Bud Bilanich. Bilanich, a former pharmaceutical company consultant, said the move was “brilliant” from a marketing standpoint. It put EpiPens in thousands of schools across the country. Mylan, the company behind the EpiPen, spent years turning a product approved by the Food and Drug Administration in 1987 into a must have for parents worried about allergies. While it had some competition in 2013, the company’s EpiPen was to injectable epinephrine what Kleenex was to tissue. It was a powerful name. And Mylan wasn’t ashamed into telling Congress about it. In 2013, the year H.R. 2094 sailed through the legislative process, Mylan spent $1.5 million lobbying members of Congress, according to the Center for Responsive Politics. Few members of Congress even bothered to consider what else Mylan had in store for the EpiPen. 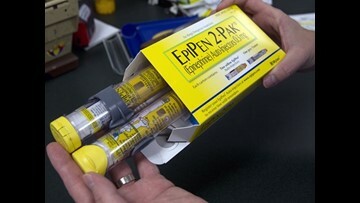 In 2012, on the National Average Drug Acquisition Cost database, the cost of a 2 pack of EpiPens was $215. The following year, in 2013, the cost was $291. This year, Mylan’s EpiPen ran $588, according to the National Average Drug Acquisition Cost, tracked by the Centers for Medicare and Medicaid Services. Only now does Congress appear agitated. Of course, as our investigation found, the members of the same committee that grilled Mylan over its pricing of the EpiPen in September also accepted $366,373 in campaign contributions from pharmaceutical companies. Mylan did not respond to numerous requests for comment. Mylan’s lobbying efforts highlight a close relationship between all of the pharmaceutical industry and members of Congress. Not that anyone will suggest the cash is changing their votes. Our records show he accepted a mere $1,000 from pharmaceutical companies since 2010. That’s on the extreme low end. Rep. Diana DeGette (D-Colorado) accepted $145,500. “I’d have to go back to see my campaign contributions that I received from pharma, but I don’t think you’d say I’ve ever shied away from a battle here,” she said. In all, with the Center for Responsive Politics, we tracked $27,795,729 in Congressional campaign contributions from the pharmaceutical industry. And it’s not just campaign contributions and lobbying efforts that reveal Congress’s financial ties to the pharmaceutical industry. 72 members of Congress have at least $8.3 million and upwards of $18.9 million invested in 13 major drug companies, according to data maintained by the Centers for Responsive Politics at OpenSecrets.org. Members of Congress have to report assets, but they do not have to give exact figures. So, for example, F. James Sensenbrenner Jr. a Republican from Wisconsin, has anywhere from $506,545 to $1,006,544 invested in AbbVie, the maker of Humira – a drug that increased 98 percent since 2012. Because of that reporting structure, we know that at least 12, and up to of 23 members of Congress have $100,000 or more invested in a major drug company. Among the members of Congress with the highest investments are Michael McCaul (R-Texas), with up to $4 million invested, Rodney Frelinghuysen (R-NJ), up to $2.35 million invested, and F. James Sensenbrenner Jr. (R-Wisc.) up to $2 million invested in major drug companies. Dr. Meg Lemon, a Denver dermatologist, has 20 years of experience. Inside her office, she keeps a book of coupons ready for patients who tell her they cannot afford the price of their medications. It’s hardly a permanent solution. More and more of her patients have high deductible plans that force them to pay far more than what a coupon could cover. “How often do you hear concerns about cost?” we asked her. “I’m mad. It’s unconscionable,” she added. “Is the system broken?” we asked. “It’s not a system. It’s a disaster,” she responded. She was direct when asked what needed to be done. “I think if we want to hold our heads in the sand and say, ‘Ok, this is ok. This is not so bad,’ we’ll just crash,” she said. “As long as there are no restrictions on the price of medications, [drug companies] will keep raising the price,” she said. As for people who think the free market applies to drug prices, she was even more direct. “It’s not an open market. If it were a t-shirt or a loaf of bread, everyone would say I’m not going to pay it,” she said. Certain drugs simply cannot be replaced. She called the focus on the EpiPen important but insufficient in the long run. “It’s only when things get so egregious that it really becomes newsworthy,” she said. 9Wants to Know will continue to cover Congress, and the many possibilities that have been considered to address prescription drug prices. Some advocate for the Medicare Prescription Drug Negotiation Act which would allow Medicare to negotiate prices. Others demand greater transparency, like the MAC Transparency Act offers or the FAIR Drug Pricing Act, which would require companies to submit a justification report before increasing prices. Congress has also considered bills like the FAST Generics Act or the RESULT Act, which could increase generic drug development and expedite the FDA’s approval process of certain lifesaving drugs. Here’s how you can reach out to your Congressman to ask them about these, and other possible legislative solutions to addressing prescription drug price hikes. Go to http://www.house.gov/representatives/find/, enter your zip code, and call or email your representative. Vote: What should Congress do to fix rising drug costs?